We look forward to breaking out our boots all summer, and with fall’s arrival, it's finally time to take them for a stroll. Nothing has as much height, style power, and sheer drama as the over-the-knee boot. Are they statement-making? Yes. But intimidating? Not at all! The key is to create balance when styling these boots, which can be paired with a multitude of things in your closet. Faux-leather leggings, bold graphic maxi dresses, and oversized knits are all fair game. Follow this guide for five tried-and-true ways to add fall's coolest boots to your wardrobe this season. A midi-length hem, which hits just below the knee, is a girl's best friend for elevated fall style. Dresses and skirts that fall at this length allow for graceful movement and create a sophisticated look that pairs perfectly with over-the-knee boots. We're a fan of dark floral prints and sleek black suede to achieve a look that exudes autumnal elegance. Go-to jeans become endlessly more alluring when you slide into a pair of over-the-knee boots. A pair of figure-hugging skinnies with plenty of stretch are ideal to keep you comfortable. This cool, feminine look has a hint of rock 'n' roll worked in, making it easy to take from day to night. Here, we topped the outfit off with a touch of peplum to sweeten things up a bit. Go long! Maxi hemlines with a side-slit add movement and a touch of drama to the mix. You only see a hint of skin, which is undeniably more daring. We balanced the bold print and overall femininity of the dress with a cool leather moto jacket and an on-trend bucket bag, while keeping the rest of the accessories to a minimum. Who says mini skirts are only for summer? One of the chicest ways to play with silhouette and proportion is to pair an ultra-short hem with a big, roomy top. 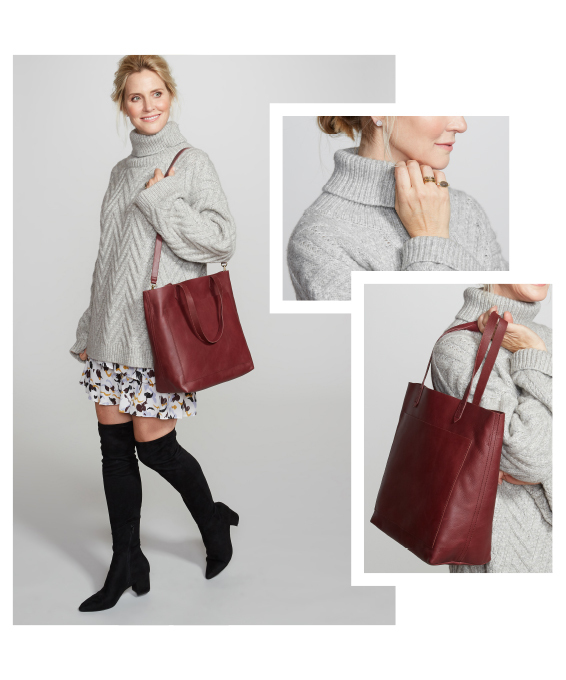 A cozy, oversized knit sweater makes an ideal top layer. The boots add enough coverage to ensure your look remains elevated—and that you stay warm. This outfit takes layering to an expert level, serving as a reminder that there’s always more than one way to wear an item of clothing. We love pairing a sweatshirt (for warmth and a casual touch) under a roomy, tailored blazer. Faux-leather leggings slide easily into boots for a casual-yet-sophisticated outfit you can wear pretty much anywhere.